Austral is a science fiction novel - I'm a science fiction writer, it's set in the future, what more needs to be said? Except that these days not all novels set in the future are science fiction. Some, for instance, deal with the effects of climate change on the world in general and human society and the human pysche in particular, and although the effects of climate change are beginning to accelerate right here, right now, the worst effects will be manifest in the next couple of hundred years. So much fiction dealing with climate change is by default set in the future. But it isn't science fiction. It's cli-fi. I don't think it's a very useful term. Not just because it echoes sci-fi, often used as a label for the worst examples within the science-fiction genre by those who ignore the preference for the term SF by those who read and write the stuff, but also because the person who coined it is something of a jealous gatekeeper, policing its use, deciding ex cathedra what's in and what's out. It's less a genre, more a marketing tool, and much of it (especially the Young Adult fiction) is both dystopian and apocalyptic. Climate change as another excuse for winnowing the excess population and staging adventures in a simplified post-civilisation board game. 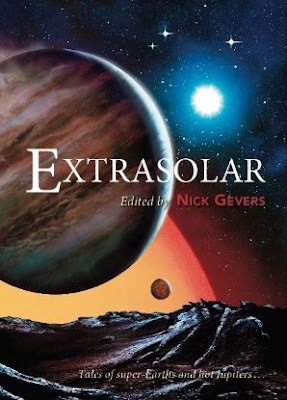 There's another sub-genre, solarpunk, which is much more optimistic, but currently there are few fictions that fall inside its boundaries, and it tends to scant the seriousness and difficulties of the immediate problems of climate change. 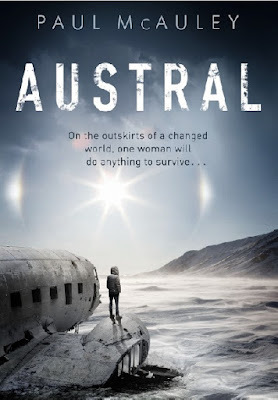 But if Austral had to fall into a category I'd rather it shaded towards solarpunk than dour cli-fi dystopias. There are all kinds of problems caused by climate change in Austral's future, but its inhabitants are making the best of what's happened -- most especially by the establishment of a new nation in the Antarctic Peninsula, and greening tracts of new land which have been exposed by the great melting. Terrestrial terraforming, or a variation of the speculative extreme gardening I described in The Quiet War and Gardens of the Sun. ﻿﻿Close to the end of the day the girl and I drove up out of the forest and crossed the broad snow-covered saddle between the Cayley Valley and Blériot Basin. A solitary peak stood off to the north, hard pinkish light glowing on its flanks, and the wind blew cold and clean and the last of the sunlight turned the snow crust’s icy lace into a carpet of diamonds. We’re simple creatures. A change in the weather or a glimpse of a distant panorama can transform our mood in an instant. Looking across snowy ridges towards that mountain peak I was struck head to toe by a tingling charge of exhilaration. We had escaped, I was about to take up the path Mama and I had once followed, and this time it would all come right.